Helping turn lives right side up by turning the world upside down. Our mission is to preach the Gospel to the world, take care of those unable to take care of themselves and train up believers to do the work of the ministry. Most people never plan for disaster, and when it happens they have no idea what to do next. Together with the local church we can help people navigate through this difficult time. Through our work, we can earn the right in their lives to share the life-changing Gospel of Jesus Christ. 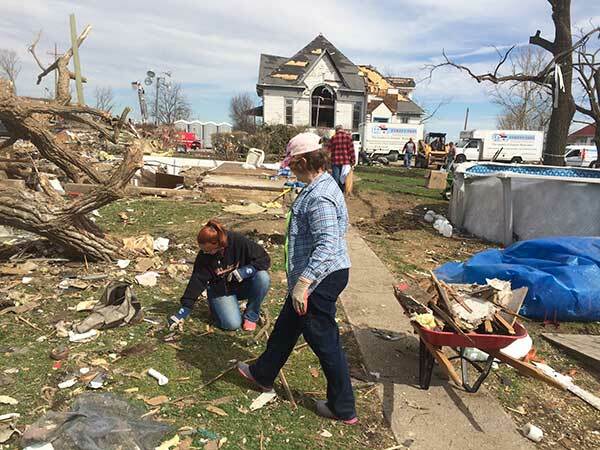 After the initial shock wears off and the first wave of volunteers leave the area, homeowners are often overwhelmed by the work that needs to be done. By making a long term commitment to an area, we are able to help walk people through to seeing their home rebuilt. Training churches to respond to disasters in their own community is a critical piece of making sure we’re as effective as possible in serving others. We know that every church and community is different, so our training is custom tailored and completely free of charge. Help and healing for those in need doesn’t just include those living in the United States. We partner with missionaries throughout the world to help them serve the community God has placed them in, building long term relationships that will last for years to come..
Are you ready to use what God has given you to serve those affected by disaster?